To the left of the library's main entrance is "The Art of Reading," Preston Jackson's tribute to children...the love of all things literary... and, finally, Jo Potter, Alpha Park's director from 1988-2000. Mrs. Potter had dreamed of housing such a work of art at Alpha Park Library, and had made close observations of different sculptures in her travels. Unfortunately, she died before seeing her dream become reality. However, with the significant financial underwriting of Mrs. Potter's family, and with memorial donations from community members, the sculpture that became "The Art of Reading" was commissioned from, and executed by, prominent Peoria artist Preston Jackson. Initial conversations among Mr. Jackson; Joy Kessler, Mr. Jackson's assistant; John Potter (Jo Potter's husband); and Marcia Brandenberg, long-time Youth Services Librarian, began in late 2001. The library reached an agreement with Mr. Jackson in January 2002, and the adventure began. Mr. Jackson created the initial wax sculpture in his Bartonville studio. The wax sculpture then was sent to a foundry for casting in bronze. Simply described, the finished piece depicts two children, a boy and a girl, sitting on a bench, reading. The figures are life-size and life-like, with great care given to detail and expression. As noted, the sculpture itself is bronze; the material of the bench is stainless steel. 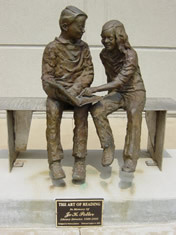 "The Art of Reading" was dedicated on Saturday, August 31, 2002, with a large crowd of library friends in attendance, including many members of Jo Potter's family. Speakers included Rob Schendel, Mrs. Potter's brother; Preston Jackson, the artist; and Valerie Wilford, Executive Director of the Alliance Library System. A reception followed the dedication ceremony. Since its installation, "The Art of Reading" has served as a kind of magnet to many children. Staff and patrons have observed small children joining the readers on the bench. Several young patrons have enjoyed "conversations" with their bronze counterparts, and more than one child has waved hello or good-bye to "The Art of Reading". The Alpha Park Public Library board and staff are delighted to claim an original composition by Preston Jackson, and trust that "The Art of Reading" will bring pleasure to many patrons and passers-by for years to come. Note about the artist: Preston Jackson, born in 1944 in Decatur, IL, is a member of the faculty of the School of the Art Institute of Chicago, serving as professor of sculpture. He is past chairman of the Sculpture Department at the Art Institute's school. Mr. Jackson also has taught at Western Illinois University, Macomb, and Millikin University, Decatur. His works and shows have been located, or featured, widely around the United States. Mr. Jackson is well known as a teacher, and takes particular interest in working with children. His other interests take him into the realms of jazz guitar, painting, and martial arts. Mr. Jackson lives in the Peoria area.